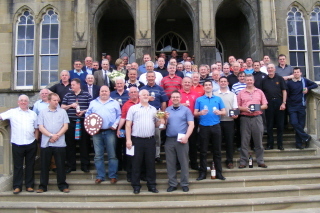 The Provincial Grand Lodge of Stirlingshire Annual Golf Competition was played on Sunday 9th May at Ross Priory Golf Course. The Group photograph below shows, front centre, Andrew A. McKinnon, Provincial Grand Master of Stirlingshire, presenting a cheque for £3,500.00 to Jess Bryce, Chairperson of the Falkirk Branch of Parkinson's UK. In the background are principals of the Provincial Grand Lodge of Stirlingshire. The money will be used to provide a number of trips and benefits for the clients supported by the Falkirk Branch of Parkinsons UK. The Annual Provincial Golf outing continues to be a major charity fundraising event within the calendar of Provincial Grand Lodge and has been staged for more than 15 years. This year along with the majority of the lodges within the Province it attracted 2 Brethren from out with the Province and recorded the highest ever golfer attendance with 60 players on the course. Our continued thanks goes to all the participating Lodges and to the organising committee.